I've been asked "Why Swords & Wizardry Light?" more than once. I've been told it wasn't needed, dumbs down the game and basically has assailed the senses of a handful of Grognards. I wrote the four pages in question to help ease lapsed gamers back into the hobby, introduce other gamers to the OSR, bring new players into tabletop roleplaying, but even more importantly as a lowered entry bar to RPGs that kids would not feel intimidated by. My niece was just a month short of her sixth birthday when I showed her an early copy of the Swords & Wizardry Light rules. Her response? "Uncle, did you write this for me? Its only four pages. You can teach me to read four pages and then I can play D&D!" To quote Carl: "How's this for cool Erik Tenkar? 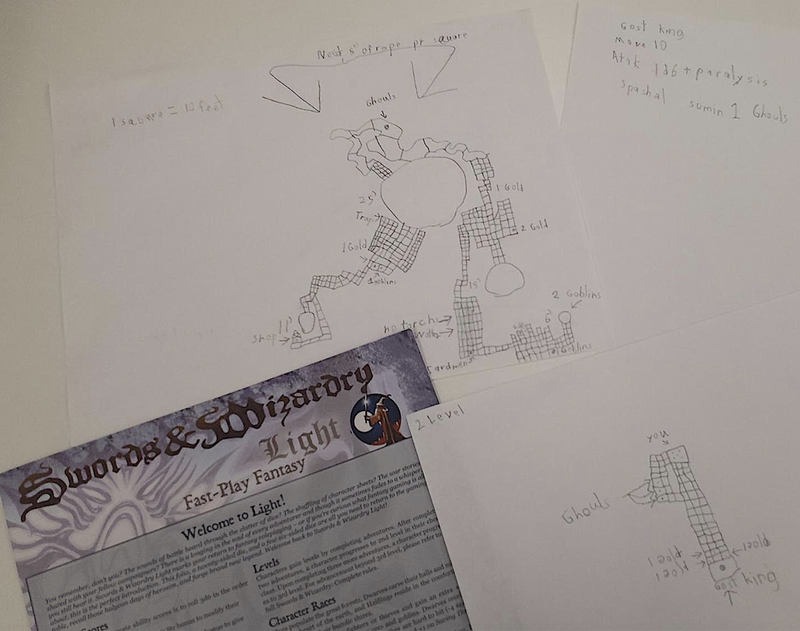 Gave a kid a copy of Swords & Wizardry Light last week at our gaming group and this week he came on with his own mapped out dungeons." This. This is why Swords & Wizardry Light exists. Sure, it's a great ruleset to run at conventions. That's a bonus. The kids, that's where it's at. They are the future, both in our gaming and in life beyond. I thought simpler rule sets was a part of playing the older editions. I am not sure what the complaint is - you can make the game as simple or as complex as you like. Swords and Wizardry covers the whole range, too - Light, WhiteBox, Core and Complete. Thanks, Erik, for your fine addition to the OSR. My daughter DMed her first games when she was six. My son was maybe 11 because he is a lot more careful and measured. I could not be prouder of the two of them. I need to get a copy of this for my son (he's seven), he'll love it! Yeah, SWL is great imo. I gave it to a lady i work with and she used it in her all women gaming group until they moved into 5e. Most were brand new to rpgs. It was their gateway drug man.